I never posted any pictures of my large Frangie Pangie ( Plumeria rubra ) or ' Aztec Gold ' tree that I have in my front yard. This is the tree that I have taken all of my clippings from. My Aztec Gold Plumeria rubra is blooming like crazy right now!! The Plumeris rubra or Aztec Gold Frangie Pangie has been know to grow up to 30 feet tall and does best in full sun to partial shade. The Plumeria blooms are very fragrant!! This is a deciduous tree meaning that it loses it's leaves, leaving an unsightful tree which is the only bad part about it. When in bloom it is amazing though. The Plumeria rubra is drought tolerant making it suitable for xeriscaping!! Here are some pictures of the beautiful blooms, Enjoy!! Here are some more pictures of my Butterfly Plant ( Christia obcordata ). You can see the flower alot better in these pictures. The butterflies were really flying today!!! Enjoy!! White Silk Floss Tree ( Chorisia insignis ) Score!! As I mentioned in my last post about the Clustered Fishtail Score, my girlfriends parents asked me to come over and dig up the Fishtail. While I was there they asked me if I wanted a White Silk Floss Tree ( Chorisia insignis ). I already have 1 that is about 5 feet tall that I transplanted from them about 6 or 7 months ago. This one is about 8 feet tall though and looks really good. I said sure I will take it off your hands. So when I was finished digging up the Clustered Fishtail I started to dig up the White Silk Floss Tree. Her parents are thinning out there private jungle as it is getting a little wild in there. It works out for both of us as I dig up what they don't want, and I get to add to my little jungle!! Win Win situation!! As I mentioned in my earlier post on the Clustered Fishtail Score I did not have my camera to snap any shots before I started the dig, or the transportation. I did get some pictures of the re-pot. I added vitamin B-2 to the soil to minimize the transplant shock and added liquid root hormone to stimulate new root growth. When I was done I soaked the pot until the water was running out of the bottom. I will water continuously over the next month or so. A few facts on the White Silk Floss Tree ( Chorisia insignis ): This tree may grow over 40 feet tall and tends to bottle up!!! This tree also love to sun bathe all day!! Extreme caution should be used when handling or just hanging around the White Silk Floss Tree as it is covered in very large, very sharp thorns!! The White Silk Floss Tree is also drought tolerant making it suitable for xeriscaping!! Here are the pictures that I did get, the last one is a picture that I found on the Internet. I posted it to give you an idea what it looks like all grown up, enjoy!!! Clustered Fishtail Palm ( Caryota mitis ) SCORE!!!! Scored again!!! My girlfriends parents have a mini jungle going on over at there house too! They asked my if I wanted a large Clustered Fishtail Palm ( Caryota mitis ). They told me it was about 5 years old, I said you better believe it!! All I had to do is go over and dig it up and take it home! I told them I was on my way!! In all of the excitement I scurried out the door without my camera AGAIN!! When will I learn?? I have no pictures of the dig, but some of the re-plant. And once again the re-plant pics are slim as the excitement of the planting caused me to forget to take pictures. It took my buddy Brandan from Another Yard In Fort Pierce to say " Where's the camera", and I said geeeeeezzzz, not again!! I did go get the camera and snapped a few shots. Before I put the Fishtail Palm in the hole I sprayed the hole with root hormone and vitamin B-2 very well. I also added each element as I added more dirt to insure good growth and to cut back on shock. Now I am watering like crazy!!!! Here are the pictures that I have. Enjoy!! Here are some pictures of my beautiful Butterfly Plant ( Christia obcordata ). It is like christmas in the spring, everything is blooming!! Here are a few pictures of my Butterfly Plant in bloom!! Enjoy!!! Giant Star Potato Tree Update!! 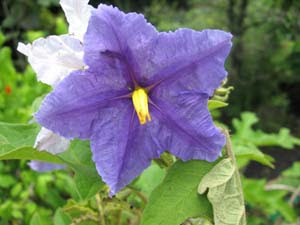 While I was watering today I noticed that my Giant Star Potato Tree ( Solanum macranthum ) was blooming!! This is a new addition for me as I have just planted the Giant Star Potato Tree 4 days ago. I just noticed some blooms on it and figured I would share the excitement!! Enjoy!! As I was watering the yard this morning I looked up at my 30 foot tall Southern Magnolia ( Magnolia grandiflora ) and noticed a few beautiful white blooms!! They are absolutely beautiful, and the fragrant smell is wonderful!! The Southern Magnolia can reach soaring heights of over 40 feet tall!!! That is a big tree!! As with almost all plants and tree's there are dangerous parts, the seeds and leaves are poisonous if ingested. Care should be taken when handling the Southern Magnolia as it may irritate your skin. Here are a few pictures of my stunning Southern Magnolia ( Magnolia grandiflora ). Today when I signed on I checked my message's like I always do. The difference today is that I have received my very first award for my all of hard work!! I have not been able to remove the smile off of my face ever since!! I feel good!! I would like to take this moment to thank Melissa from The Secret Garden for awarding me with this Excellence award! Thank you very much Melissa, you made my day!!! In my eyes you are all doing an Excellent Job and you all deserve this special award!! Keep up the great work everyone!!!! Today I started germination on 22 Triangle Palm ( Dypsis decaryi ) seeds. I placed these seeds in a polystart solution 4 days ago and let them soak. I have done this to speed up the germination process. In the first picture you can see my tools. My incubators 12 and 13, polystart container with 22 Triangle Palm seeds and tweezers. I use tweezers because it is not a good idea to touch the seeds once you have started germination. I germinate my seeds in peat pellets which I purchase from my local garden center for really cheap!! The second picture is a closer look at the seeds. You can also see the process of prepping the peat pellets. The ones on the left have just been placed in the warm water and the ones on the right have been in the warm water for about 5 mins. In the 3rd picture you see my process unfold. I place the Triangle Palm seeds on the tops of the peat pellets so I can remember which ones have seeds. If I just start putting them down I forget where I started and try to put seeds in already occupied holes, waste of time. This way I know they all have seeds and if I don't see them they are already in. In the forth picture you see all the Triangle Palm seeds are in!! The final picture shows the incubators sealed, labeled, and ready to go!! The heat from the warm water is fogging up the incubators, this is good as heat and humidity are positive factors in germination. During my trip to the Farmers Market I ran across something that I have wanted for quite some time now. The legendary Mini Red Pineapple. I am having trouble identifying it though. All of the pineapples that I pull up have serrated edges where as this one does not, it has smooth edges. I am uncertain of the age but there is another spike off of the side. If you have any information on identifying this pineapple please let me know!! Here are some pictures of my very attractive Mini Red Pineapple!! What do you think?? Ahh, the Giant Star Potato Tree ( Solanum macranthum ). I have just purchased one of these beauty's and added it to my garden(jungle) lol!! The Giant Star Potato Tree grows very fast, and enjoys basking in the full sun. You must be careful when handling this tree as it has very sharp thorns all over it. There also seems to be a fiberglass kind of hair all over it that iches really bad. The Giant Star Potato Tree also is a very thirsty tree so you will want to water it alot. The first 4 pictures are of my baby Giant. As you can see the leaves are very attractive. The last 3 pictures I found on the Internet and posted them so you can see the magnificent blooms that form all year round. 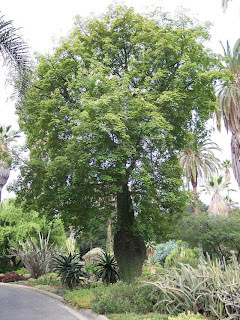 The very last picture is to show you the massive size that the Giant Star Potato Tree can achieve. I hope you enjoy the pictures!! My best score yet!! I have heard of this plant for quite some time now and have been very unsuccessful in finding it. This is the variegated Sea Grape ( Coccoloba uvifera ). Sea Grape grows every where around here and I have been looking at every one I see and never see a variegated one. This form of Sea Grape is extremely rare!! Well I have found one at the Heathcote Botanical Sale that was held this past weekend in Fort Pierce, Fl. at the Heathcote Botanical Gardens. This extremely rare plant came with a hefty price tag. Me and my buddy Brandan from Another Yard In Fort Pierce split it, and we will air layer it to get two plants out of it. It is well worth it since I believe that we are the only two people in town that have this very rare plant!! Here are the pictures of the beautiful Variegated Sea Grape ( Coccoloba uvifera ). Enjoy!! Here is another score from the Heathcote Botanical Sale that was held this past weekend here in Fort Pierce at Heathcote Botanical Gardens. This is the Crocodyllus or Crocodile Fern ( Microsorum musifolium ). This is a very interesting fern that I have wanted for quite some time now. They just don't sell them in our local nursery's, and if they do they are very expensive. I am attracted to this fern because of the Crocodile skin look and texture of the leaves. I do not know where to put it yet but all that matters is that I have it!! Here are some pictures of my new Crocodyllus or Crocodile Fern ( Microsorum musifolium ). Orchid Score!! New Purple Phalaenopsis!! Crinum ( Crinum powellii ) Beautiful Blooms !! Silver Dollar Gum: The Air Layer Project!! Best Seed In The World Update!! My Biggest Orchid Project Yet!!! The Downtown Fort Pierce Farmer's Market! !